Simple text and beautiful artwork help toddlers understand God's world and key Bible topics. Does God really see us all the time? Where is God when we are worried? Why is it important to be kind? Using age-appropriate images that ages 0 to 4 are sure to identify with, each book uses a Scripture to inform the story's theme. Whatever Is Lovely shows children that even though life has troubling moments like being afraid or sad, we have a God who listens to our prayers. Based on Philippians 4:8-9. 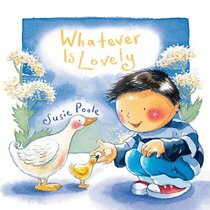 About "Whatever is Lovely (Pupfish Series)"
Customer Reviews For "Whatever is Lovely (Pupfish Series)"
This is a great little board book to start reading to your baby and continue up to toddler. It is such a simple way of teaching the great thought patterns God teaches us to have in Philippians 4:8-9. The illustrations are sweet, beautiful and detailed. Great gift for any young child!